← How time flies! The new Tea Bar website. Such a delay! 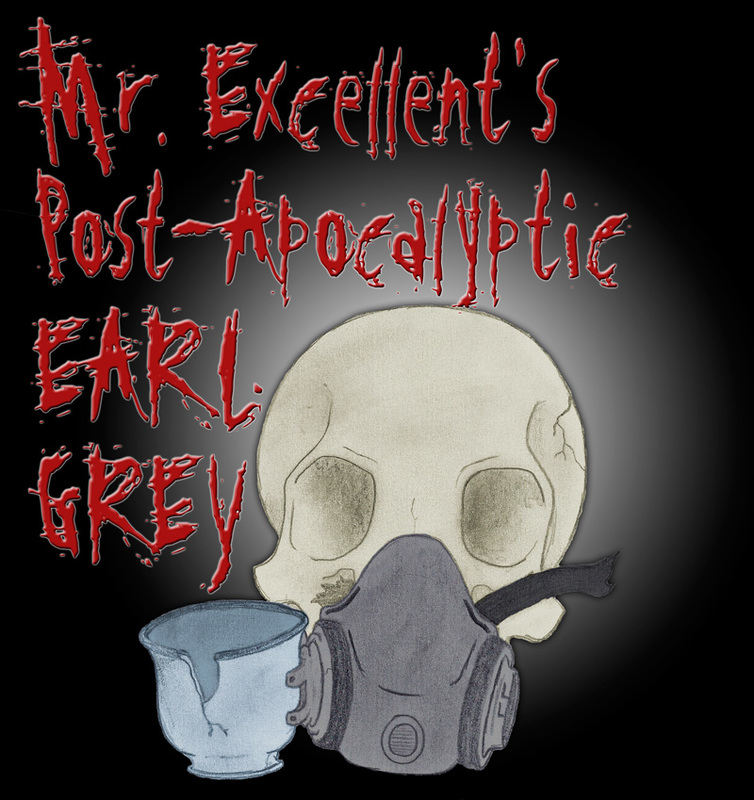 It was about eight months ago that I came up with the Mr. Excellent’s Post-Apocalyptic Earl Grey Tea blend (see my blog post about it here), and we finally have a logo for it! This one was drawn by my son’s friend from college, Brandon Pope. I’ve found that logo art comes out better if I don’t tell the artist what I want, so I gave Brandon little more information than the name of the tea and what it is (an Earl Grey lapsang souchong). If I could draw, I probably would have done something with a dude sitting in the middle of a burned-out town, his shotgun at his side, drinking a cup of tea as the zombies eye him from a distance. In other words, something way to complex to use as a logo. Brandon came up with the skull and gas mask, with one of the air filters replaced by a teacup. Very simple, yet immediately recognizable. His original was a hand-lettered pencil sketch (see below), which I needed to colorize. Brandon’s shading was great, especially where the texture of the paper showed, so I just added solid blocks of color behind the skull, mask, and teacup. I really, really wanted to put this one on a black background, and I just couldn’t seem to make that work using his text. I re-did the text using a fun font called “Disgusting Behavior,” stretched vertically to achieve the look and aspect ratio that I was after. A blood-red color for the text with a subtle glow and an emboss effect finished it off perfectly. For comparison, here is Brandon’s original pencil sketch (below) and the final logo (above). You can click on the final logo for a larger image. This whole program of guest artists for tea logos (kicked off by Al Jones and his Hammer & Cremesickle logo) has been a blast. Thank you very much to Brandon for the artwork, and watch this space for guest logos by husband and wife team Doug and Suzanna Bailey, coming up soon. Posted on 26 May 2012, in Styles & Blends, Tea Biz and tagged blends, Brandon Pope, earl grey, lapsang souchong, logos, Mr. Excellent, Mr. Excellent's Post-Apocalyptic Earl Grey, tea. Bookmark the permalink. 1 Comment.